Last November we featured Mr. Owens’ sculpture, the St. Augustine Foot Soldiers Monument. 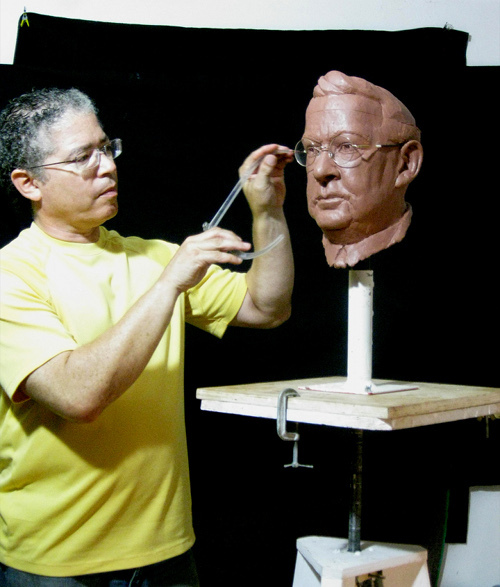 In today’s post, Mr. Owens shares details about a typical day in his life as a working sculptor. The first thing I see when I open my eyes is a pile of art supplies. Eight o’clock is early for me. I’m not really awake. Carefully, I follow a path to my computer to play some upbeat light classical music that I found online. For me, music is like coffee. While my primary studio is in my home, the place only resembles a home from the outside. Inside, it would be a proper studio were it not for my current sculpture project that has transformed the studio into an unbelievable mess. This arrangement works for me but it’s easier to start working on art if I leave home and come back. I think it changes the chemistry of my brain. I start the day by re-drawing my concept for a sculpture commission that I’m competing for over coffee at a local cafe. I’ll continue this daily ritual until I’ve developed a composition I’m happy with. Naturally, I look outside myself for ideas and inspiration but I don’t wait to feel inspired before I put pen to paper. For me, habit succeeds over inspiration. Leonard Cohen said it best: “as a writer, you have to show up and go to work everyday. But you do so knowing that today it may not come … that you are not in command of this enterprise.” Today it came. I return home with a coffee in one hand and some good drawings in the other. Like most artists I know, I push myself hard. But I was unprepared for the level of sustained effort that goes into marketing and self-promotion. It’s 3 o’clock already and all I’ve done is move paper around. On average, I spend nearly half of my time doing this; a sobering statistic that I try not to think about. In a perfect world, I would have a spouse handle marketing and act as the central nervous system of this enterprise. I would also like to work in a castle overlooking the ocean, sculpt entirely from life and be loved by all. I’m not holding my breath. It’s five o’clock. Now the fun begins as I shift gears and continue work on my current sculpture commission. This one is paying the bills. 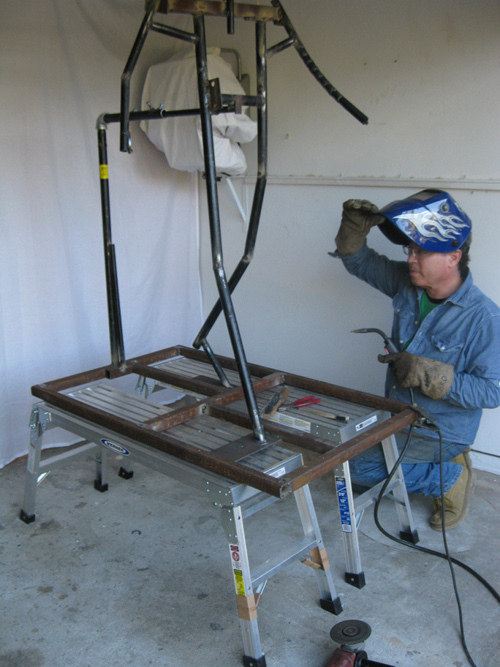 Happily, I’m done with tasks that involve getting up early and working in daylight such as welding. For the next few weeks, I get to ignore the clock, work late into the night until exhaustion or collapse and wake up whenever I want, as is my custom. The plan is to apply clay to the armature I just completed. I’ve been looking forward to this part and to nightfall. With darkness comes tranquility. I enjoy company but I’m at my best when the rest of my world is asleep. 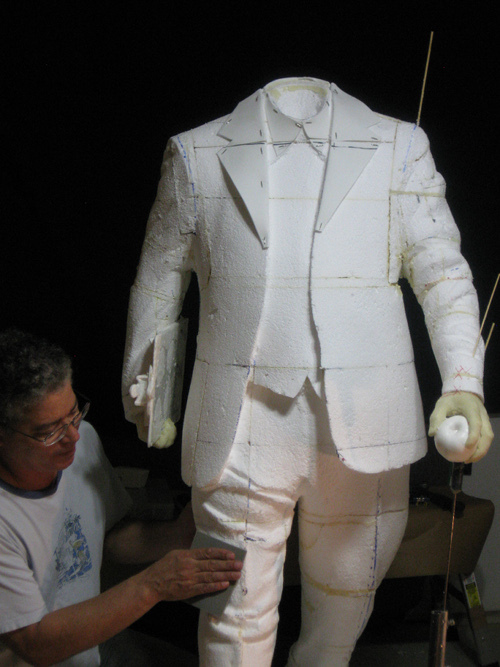 The schedule requires that I accelerate progress and that’s fine, because the foundation of the sculpture is correct. One gentle, forward push of the throttle is all it will take now. The night-time is the right time. This entry was posted in A Day in the Life and tagged Brian Owens, culture builds florida, florida division of cultural affairs, St. Augustine Foot Solider Monument by culturebuildsflorida. Bookmark the permalink. I loved reading your about your “day”. You are quite funny and I love your sculpture! I hope Florida realizes what an incredible artist you have in Brian Owens. I have seen his work, it is of the highest quality and it speaks to people. What an intriguing article…well done Brian. Thanks for sharing with the world Brian. A description of your “day” underscores the hard work and tenacity that goes into every facet of “making art”. It demystifies what being an artist means and, I think, helps people appreciate even more what you do. Thanks Trent. That’s high praise, coming from you. Hopefully, this blog will put human faces on “the arts”, making the subject a bit less abstract to people who feel there’s something special about art but who are not immersed in it as we are. “Demystify” indeed. I agree with you and I’ll take it one step further: I wouldn’t trust anyone who was numb to the human need for the transcendent. The things we can’t quantify but we know that we need. We may find these things in a woman’s smile, the splendor of the natural world, great music, a good story or – as William H Gass put it – “things whose purpose is contemplation and appreciation”. This is wonderful! I can’t wait.